The latest in the collegiate pole vaulting world. NCAA DI, DII, DIII, NAIA, JC, CIS are all here! 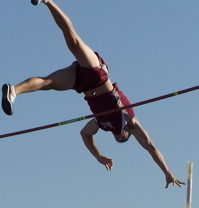 Collegiate Team Links- Links to team websites for every collegiate track and field program in the United States and Canada and information on the pole vault coaches for each school. 2006-2007 Collegiate Coaching Changes - What pole vault coaches have come and gone during the summer? Find out here. - 2005 Incoming Freshmen and Transfers - See where the class of 2005 decided to go to college.